In recent years, finders have become larger and larger, a larger diameter in fact helps to find more easily the objects. Often, however 50mm or 60mm diameter finders (excellent since they collect a lot more light than classic 6x30 models) are supplied with a too simple mechanical support and they often loose the alignment with the main telescope. Our PLUS finder support instead provides a perfect mechanical support to install finders or small guide telescopes on many telescopes. To use with these telescopes: AIRY APO65F, AIRY BLACK 80T, AIRY APO104T (it needs the optional DX finder base), AIRY APO150T (it needs the optional DX finder base) and telescopes from other brands. 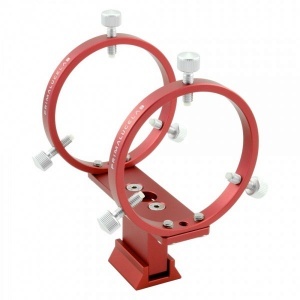 This Deluxe PLUS guide scope / finder scope support can be installed into the quick base (finderscope shoe) present on many telescopes and allows you to install the finder in an absolutely stable way. Unlike conventional finder supports, it has two support rings (80mm PLUS guide rings), each with 3 screws (set at 120º) with Nylon tips that does not damage the inserted accessory. 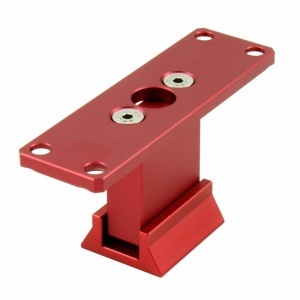 This support provides high rigidity and therefore it is also perfect for those who want to install, instead of the classic finder, even a small guide telescope. With a short focal length refractors in fact you can also use small guide telescopes, combined with a proper autoguiding camera, to automatically correct the mount tracking during the long exposures. Especially with compact size refractors, you create an exceptionally portable instrument, perfect for astrophotography sessions from farther away skies (for those who are looking for places without light pollution) or for a travel instrument. The two rings of the support have an inner diameter of 80mm then it can support not only the classics 8x50 finders but also other small guide telescopes with larger dimensions.